The untimely death of franchise star Paul Walker does alter this chapter a bit, but not in ways that might be expected. He’s back as an equal member of the crew, and plays out his role to the end, even though the production had to rework the story after his demise. Whether the filmmakers – including director James Wan replacing Justin Lin – became inspired through the memory of Walker, or they just wanted to take it to another level, this latest F&F saga is a breathtaking popcorn movie, with action and thrills akin to a hyperbolic dream state. The muscles are more muscular, the cars more auto-motivating, the gals more killer (in all ways) and the emotional stakes more…well, just more. It maintains the credo that the car is the star, but the personalities do help by injecting a B-movie cartoon ethos in their heroic forms. Even the villain, portrayed by action star Jason Statham, is kind of a hero. 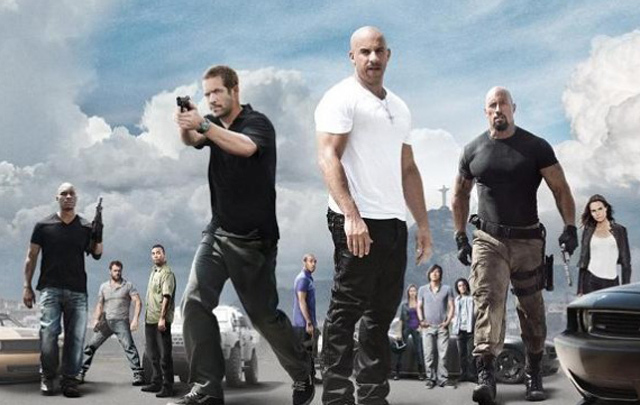 “Furious 7” rocks! Conceived as a sequel to “Fast & Furious 6,” it finds Dominic (Vin Diesel), Brian (Paul Walker) and the rest of their crew returning to the United States after defeating Owen Shaw and company. But a new threat rears up, Owen’s brother Deckard (Jason Statham) wants to exact revenge, and he begins by confronting Luke (Dwayne Johnson), and putting him in the hospital. Dominic swings into action, and gathers the driving crew to go after Deckard. This means confronting Letty (Michelle Rodriguez) about their relationship, and teaming again with goofball Roman (Tyrese Gibson) and tech expert Tej (Ludacris). There is a rub to this plan, as Ramsey (Nathalie Emmanuel) – one of the world’s leading hackers – has a surveillance software that mysterious agent Frank Petty (Kurt Russell) desires, and he promises that he will deliver Deckard if the team rescues Ramsey from an evil cabal headed by Jakande (Djimon Hounsou). It’s a fairly complex plot done in a comic book style, so the delineations between the good (the F&F crew) and the evil (Jakande, Deckard, possibly Frank) are all accounted for, and confront the team in outlandishly amazing ways. There was a literal cliffhanger, as well as tricked out and mind blowing automobiles, helicopters, drones and parachute drops. Fighting this array of forces, the crew travels the world, including Abu Dhabi in the United Arab Emirate. There, it combined a beast of a car and three skyscrapers. Do the math. The Paul Walker tragedy most likely changed the direction of the story, and since he had only completed half the film, the production has to use doubles and CGI to make it look like the actor had participated in the entire story. It’s obvious in places, but who really cares? Fans of this series have a vested interest in their connection to Walker, and the film does a great job of sending him off to another realm, passionately and metaphorically. The combination of the action with the veteran and cocksure driving crew is potent. The gang has great chemistry, and play off each other with an assured playground-type ease. They want you to come along for the ride, and they know their interaction with the outrageousness of the action is just as important as the stunts themselves. Credit new director James Wan (“The Conjuring”) for handling the dream team and the Walker situation with ease, and for the production in adding wily Kurt Russell as a mysterious operative. He handles his catchphrase lines with the beauty of a Shakespearian action hero. The B-movie feel of the film means some stiff acting ahead, and Vin Diesel could probably go through years of thespian training and not get it. I have no idea why they put that man into love scenes, but I have to admit it’s part of the charm. And the film will win no awards from the National Organization for Women. There is a lot of objectifying in the film, including a hacker that looks good in a swimsuit, and Michelle Rodriguez going on some sort of crash diet for her skin baring scene. 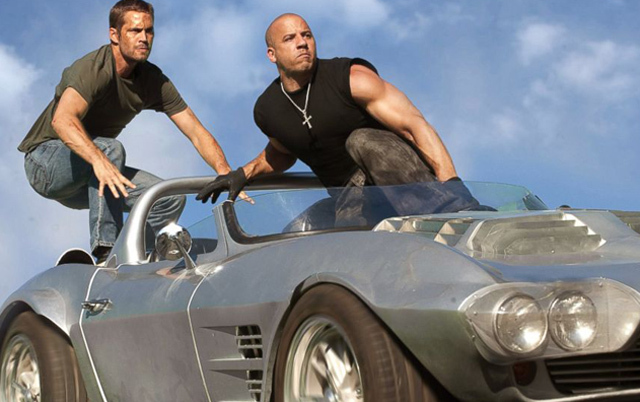 In the tradition of the 1970s grindhouse films – and “Furious 7” is a $250 million dollar grindhouse film – there will be some exploitation. It’s too bad the ladies have to take the brunt of it. In some parts of the country it’s warm enough to pretend its summer, and this is the perfect kick off film for that feeling. It’s those luxurious moments of pure escapism that is the essence of “Furious 7.” And what better weekend to get that renewal than Easter and Passover.